All right, we have a cave-comrade for the little ones, how about a Cro-Magnon man for the older set? Oooo, with this theme I can't resist the chance to share one of my favorite numbers by my all-time favorite movie star, the saucy and sensational Ann Miller!!! Here she is with Gene Kelly, Frank Sinatra, Jules Munchin, and Betty Garrett in the film "On The Town" (1949). Why the producers felt the need to throw in that stereotypical "ooga-booga" weirdness is beyond me, but please ignore the dated stuff and instead pay attention to the timeless appeal, namely the world's greatest emerald green dress, and the eighth and ninth wonders of the world: Ann's legs like butter, topped with toesies clocked at 500 taps a minute. "I love self-expression!" "We look back and wonder, "How did we do all that?" It's simple. We loved the game so much, we just looked past everything else. We were ballplayers. There was nothing we would have rather spent our time doing. how he would have loved this book! 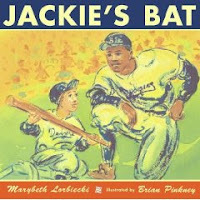 JACKIE'S BAT by Marybeth Lorbiecki, illustrated by Brian Pinkney (Simon and Schuster) (6 and up) A fictionalized account from Jackie Robinson's bat boy is the vehicle for an accessible story about tolerance and how people even during times of terrible intolerance have still stepped up to the plate. 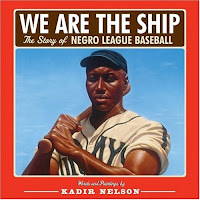 Fans of Jackie Robinson will also love Myron Uhlberg's DAD, JACKIE AND ME (Peachtree) (7 and up), based on the author's experience of being the child of a deaf sports fan; the stirring scrapbook-style life story; PROMISES TO KEEP: HOW JACKIE ROBINSON CHANGES AMERICA by Jackie's daughter Sharon Robinson (Scholastic) (8 and up); STEALING HOME by Ellen Schwartz (Tundra) (10 and up), a well-developed novel about a mixed-race boy who finds hope and acceptance in his family and beyond, thanks to Jackie's rising star; then there's one of my very favorite children's books of all time, the brilliant novel IN THE YEAR OF THE BOAR AND JACKIE ROBINSON by Bette Bao Lord and illustrated by Marc Simont (Harper) (10 and up), about how baseball impacts a new immigrant. 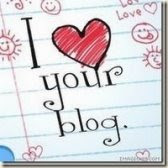 Gosh, if I could just get through reading that last chapter out-loud and not choking up...and I don't mean on my bat! Sigh! 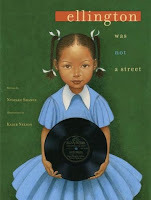 BAT 6 by Virginia Euwer Wolff (Sholastic) An oldie but goodie (which means it's available in paperback), this provocative piece of historical fiction follows a girl's baseball team as two players struggle, one Japanese girl recently out of internment, and one girl who has lost her father in the bombing of Pearl Harbor. 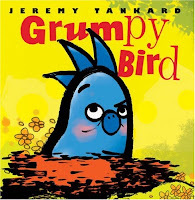 A brave storyline with plenty to discuss in mother-daughter book clubs or classrooms. (10 and up) A picture book on the same theme is the powerful BASEBALL SAVED US by Ken Mochizuki, illustrated by Dom Lee (Lee and Low) (8 and up). PECORINO PLAYS BALL by Alan Madison, illustrated by Anna Laura Cantone (Atheneum) Hilarious account of a rookie's first little league game. (5 and up) Tee-ballers will also warm up to Leonard Kessler's classic I-Can-Read book, HERE COMES THE STRIKEOUT (HarperTrophy) (5 and up). ZACHARY'S BALL by Matt Tavares (Candlewick) Ever want to be one of the lucky few who catches a foul ball? The one Zachary's dad nabs at Fenway seems to have other-worldly powers to make baseball fantasies come true. Check out all of Tavares' baseball books (MUDBALL, OLIVER'S GAME, moments of magical realism captured in the alluring, black-and-white pencil style from the school of early Chris Van Allsburg. THE BIG FIELD by Mike Lupica (Philomel) A sportswriting master creates a scintillating story of a mushrooming competition between boys, set against the backdrop of an impending chamionship game. 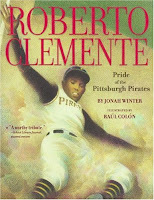 Father-son dynamics, old school vs. new school styles and a real passion for the details and depth that make baseball our national pastime all converge to make this a home run for older readers. (11 and up) Some people are saying Lupica is the new Matt Christopher or John Tunis. But hey, don't retire these guys yet! 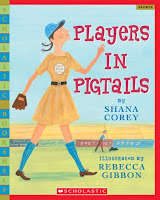 Keep them in your rotation to get on base with intermediate readers who could use a squeeze play from sports fact to sports fiction. And finally, speaking of time travel, I just have to make sure everyone has a copy of Christopher Bing's rendering of Ernest L. Thayer's immortal poem CASEY AT THE BAT, a 2000 Caldecott honor winner. 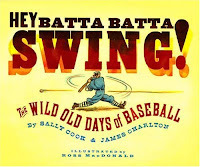 Stunning how-did-he-do-it illustrations in the style of turn-of-the century engravings, peppered with collaged remnants of baseball days past, perfectly frame the erudite language of the ballad and make it a home run even for modern readers. A great keepsake gift for any baseball lover of any age. 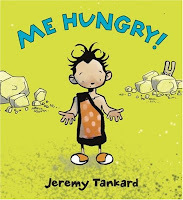 If you have a reluctant reader with a sporty streak, try this tack! 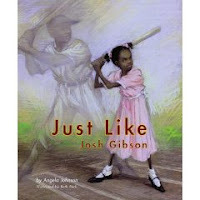 On an index card, create a baseball diamond, and assign base values for books: a triple for a novel over 96 pages, a double for non-fiction, a single for a picture book, a home run for every four books read or two hundred pages...whatever motivates your player to round the bases without being overwhelming. Keep the cards all through the summer, and calculate the average through the season. Reward your rookie with a trip to the ballgame...go to the dugout early, and have the players autograph his or her favorite baseball book instead of a program!